The American Revolution led to the Declaration of Independence (1776) by the thirteen colonies in The Romantic Movement. The French Revolution was a shattering and sundering event which affected the whole of Western Europe in several ways, The French Revolution received enthusiastic support in the beginning from the liberals and radicals in England. The Declaration of the Rights of Man by the French National Assembly was welcomed. Edmund Burke disapproved the events in France in his Reflection on the Revolution in France (1790). Tom Paine issued a spirited rejoinder to Burke in his Rights of Man (1791-92). Tom Paine pleaded for a ' democratic republic for England by peaceful or violent means. Another book, Inquiry Concerning Political Justice (1793) by William Godwin made a great impact on Wordsworth, Shelley and others. Godwin predicted that eventually all property would be distributed equally and all government would disappear. Later events in the French Revolution, notably the execution of the royal family, the guillotine of innocent people during the Reign of Terror, and Napoleon's dictatorship disenchanted the early supporters. The economic sphere also saw great convulsions. The manufacturing class became more powerful than the agricultural class. With the invention of James Watt's steam engine which replaced wind and water as sources of energy in 1765, there was a revolutionary change in the means and pace of production. The population of England was becoming either owners and traders or wage earners without property. Thus the people were effectively divided into the rich and the poor. With the introduction of more machinery into industry, there was more unemployment. The, soldiers demobilized after the French wars aggravated the labor market. There was an economic depression in 1815 caused by the fall in 'wartime demand for manufactured goods, these political, economic and social factors caused agitations and riots by the working class. The ruling class responded by more repressive measures. The unrest culminated in passing the Reform Bill which met the political of at least some sections of the population. There were important developments in other spheres also Capt. James Cook circumnavigated the globe (1768-71) and discovered Australia and the Sandwich Islands. Fascinating accounts of life in the South Seas led to a re-thinking on the nature of society and the political systems. Ocean travel became safer with Cook's accurate charting of the coastlines. The exploitation of new markets in India and elsewhere gave a fillip to commerce. This in turn led to the development of industry and technology. The dissemination of ideas kept pace with the improvements in the communications network. The pamphlet became a powerful means for debating controversial issues. For instance, the debate on the French Revolution was conducted through pamphlets. Eventually the pamphlet was replaced by the periodical for debate on political reforms further. Parliamentary Reform was inspired by the achievement of the middle class in France. Public opinion in England favored representation to big towns leading to the passage of the Reform Bill. The Romantic writers lived through such momentous changes in the political, economic, social and literary spheres. 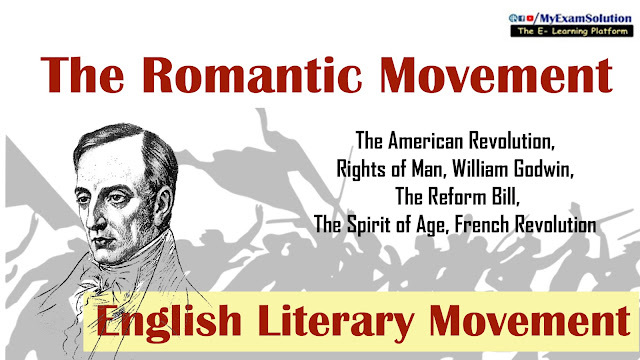 The idea of revolution informed the Romantic Movement from the beginning. Many major writers of this period were aware that great changes were taking place around them and that these changes would inevitably find their way into literature also. The French Revolution seemed to be the great divide and the beginning of a new era in the history of mankind. William Hazlitt rightly observed in his book, The Spirit of Age. "There was a mighty ferment in the heads of statesmen and poets, kings and people.. .. It was a time of promise, a renewal of the world - and of letters". The French Revolution swept away time-honoured hierarchies in different spheres. The new slogans, liberty, equality and fraternity promised a free and egalitarian society. Monarchy was abolished and the feudal structure was demolished, The principle of the dissolution of hierarchies carried into literature meant that the epic and tragedy which were at the top of the literary pyramid had to yield place to such forms as the lyric, the ode and the ballad. In language, the cultivated speech of the elite was sought to be replaced by the speech of the common people. In the choice of themes, great events had to make way for more commonplace incidents.